During the winter service rituals, we make offerings to the stars that “govern” our lives signifying our choice to respect that which is beyond our control. This comes from practices adopted into Esoteric Buddhism in which stars and planets were regarded as divinities, and included in mandalas for prayers and rituals. This gave people a practical means of effecting inner transformation by linking with the cosmic forces that move the stars in the sky and rotate the planet without our human intervention. The Star Ritual period, during which a star offering rite is conducted daily, is held beginning with the winter solstice and concluding at the traditional seasonal divide. It comes at the time of the lunar New Year, when we are reminded of change, especially within ourselves. The Star Ritual acts as our own ritualistic purification of the delusions or karma that hinder our buddha nature from emerging. The practices of purification for spiritual growth and repentance for inner purification are performed along with the prayers and rituals. The rites are directed at transforming the stars that govern negativity into ones that govern and boost positivity, and help to reorient our minds so that we can transform our lives in the New Year. The Shinnyo-en Winter Training is held beginning with the new year and also concluding with the seasonal divide. That is why the end of the Winter Training coincides with the final homa (or spiritual purification ceremony) of the Star Ritual. During Winter Training, we endeavor in acts of purification—specific acts of practice to polish ourselves and awaken our buddha nature. Jan-1975: A letter requesting that I contribute an article for the magazine Josei Bukkyo [“Women in Buddhism”] arrived while I was out preparing for a propagation trip to [the northern region of] Tohoku. Upon my return I read the letter, and when I saw the proposed title, “The Nirvana Sutra: A Light in My Heart,” I truly felt that the Mahaparinirvana (Nirvana) Sutra is indeed a light in my heart. I would even go as far as to say it is my life. (Buddha Shakyamuni) urges each individual to become a person who gives true spiritual support and encouragement to others. At the same time, he explains that the Nirvana teachings cannot be grasped only by theory or logic but must be mastered above all through actual practice; that is, putting the teachings into action. Many of history’s greatest leaders share a commonality – a side affection for the Arts, whether it be music, painting, fictional literature, or even acting. It may be that these elemental activities, that are based more on individual creativity and interpretation than well-defined scientific guidelines are what create the flexible and innovative leaders around us. For example, a leader who has been well-versed in laws and regulations, who knows how to “play exactly by the book” may be left uncertain in times demanding alternative approaches, or when facing rapidly changing challenges. The person who is used to making the best of whatever the given situation presents, often has the freedom to think beyond conventional solutions and offer new strategies that may extend far beyond the conservative mindset. Today the world is facing endless problems due to climate change, political tensions, economic crises, a soaring population, natural disasters and diseases, but the lovingkindness that already lies within our hearts and forms the core of genuine spiritual practice can help dispel these dark clouds to reveal a brighter future. Lovingkindness is the good within us and the basis of humanity and philanthropy. Acts of lovingkindness will lead to the serenity and peace of mind that comes from feeling close to others. Good things come from loving acts and kindness is born from putting one’s beliefs into practice. As our kind and caring actions accumulate, we come to understand through personal experience the interdependence of all life along with the joy of living and being given life. To begin this process, the steps we take, however small, should be sincere and full of lovingkindness. Every moment that we spend being a good friend to others polishes our buddha nature further, allowing us to move closer to buddhahood. Let us expand our ties of friendship in the world. 1. Contributing through steps of lovingkindness. 2. Acting on our sesshin experience. As the practice of sesshin training helps of understand our own flaws and areas needing encouragement, it is not enough just to understand that you and I have things needing improvement, but we must take steps towards actually changing ourselves as part of our efforts to reflect a better example for others. Let us never fail to endeavor and pray till the world of joy is realized. Note that prayer and self-focus is second, and making efforts comes first. This is because by actually engaging in honest efforts to encourage and support others, self-transformation comes as a symmetrical byproduct of the process. The spirit of friendship will expand in the world when we strengthen the bond we have to our own buddha nature, and to each other. — with Janet Song, Julia Cho, JoAnn Paolantonio, Ivan Davila and James Lui at Sunset Triangle Plaza. It’s Here, IT’S HERE! Geeks! The Musical! 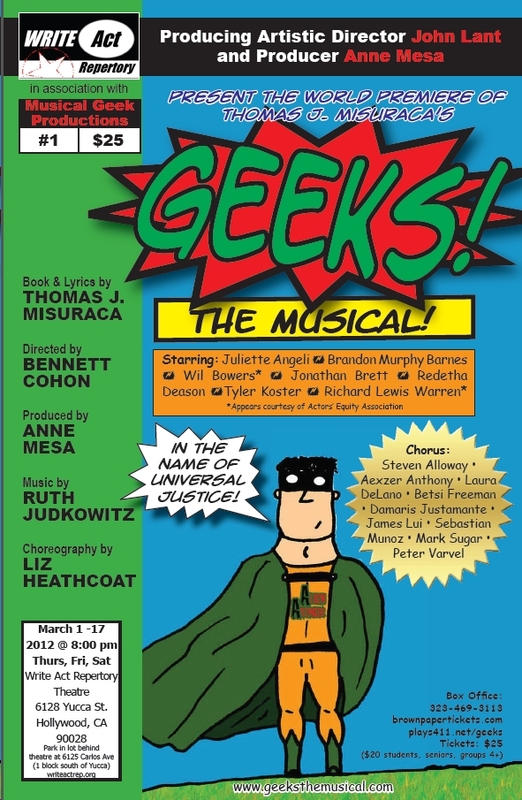 Thanks to the caring efforts of Tom Misuraca (W), Bennett Cohen (D), Anne Mesa (P), Ruth Judkowitz (M), and Liz Heathcoat (C) – We’re coming to the stage in song, dance and full dress geekiness! The Comic-Con comes to life in Hollywood! Geeks! The Musical! For those who do not know, a Comic-Con is a convention amassing fans of a huge number of different themes in one: comic books, science fiction, movies, books, costumes, characters, anime, fantasy, gaming, Dungeons & Dragons (role-playing games), online gaming, card games, MMORPG‘s, Angry Bird look-alikes, people who want to look like their favorite character (or people who want to BE their favorite character). Geeks! The Musical is a stage adaptation of that multi-ennial experience that normally could only be absorbed by standing in HUGE lines for the possible chance to get a brand new pre-release toy/video/shirt/comic/thing. For the price of admission, you will witness love and hate relationships at play amidst the cacaphony that is, The Convention. See what attendees normally laugh and point at with a smirk, thinking “Does that person know what they look like! ?” YES! We do and are ready to SING about it! See it before our ticket prices climb to the astronomic levels of the CON! Playing the 1st 3 weeks of March 2012 (through 3/17), Thursday/Friday/Saturday at 8:00 p.m. (PST) at the Write Act Repertory Theatre in the heart of Hollywood, CA.